This was inspired by a Michael Smith recipe. It was delicious. I cooked all the elements in a cast iron pan, as I don't have a grill. Chicken breast, pineapple, orange bell pepper, red onion, snap peas, cilantro... with some oil and a bit of salt. Fantastic. All that great caramelized flavour is what it's all about. 1. Cut a whole pineapple in slices, or buy pineapple sliced into rings. Chop your pepper into fairly sizable chunks, as we will grill or fry it, and de-seed. Cut red onion into thick slices, maybe 1 inch thick. 2. 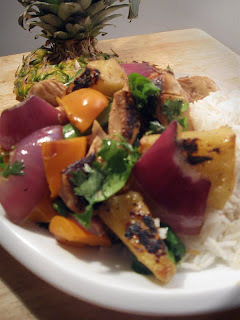 Take the chicken, pineapple, peppers, and red onion and grill all at the same time. Or do them in a cast iron pan if you don't have a grill. Flip them all so they cook on both sides. They will all cook at different rates. The onion and peppers should get done first. While the pineapple and chicken will take longer. 3. Once everything is off, and a little cooled down, chop them into smaller bit size pieces. Almost like a stir-fry. And mix together in a bowl. Add in some chopped cilantro and toss. This recipe doesn't even need any dressing because the juices from everything should be enough. You could add a little salt or pepper maybe if you choose. But I like the freshness of just these grilled veggies and fruit complemented with the chicken.